A few posts prior to this I wrote about my intentions of going back to Rumley, Ohio with my little sister. This trip finally happened on our Spring Break. It was kind of awesome and often hilarious. Lil’ Amsters (as she will be referred to) came over to my house around 9ish and we prepped for the trip. Camera (check), maps (check), notes (check), computer (check), and coffee (double check!). We were set! I drove. This was probably for the best, despite the fact that I have an older car than Lil’ Amsters, and it often drives like it’s going to fall apart at any second. I have recently (over the past 10 years) developed a car sickness issue. It has gotten to the point where if I am not driving, I get super nauseated. Sometimes even when I am driving, but the roads are super windy, I’ll still feel a little wonky. If I’m in the backseat…watch out. I will be moaning and whining within minutes. The backseat of a large automobile, like a van, is almost unimaginable to me now. Amy has her own car issues. She has developed a fear of driving on the interstate in construction, or along walls, or near semis, which is pretty much MOST of the interstate. In fact, as we were driving she told me a hilarious story of a recent trauma stemming from her fear, which culminated with the QOTD (quote of the day): ” …and that was when I realized I could never drive monks to the airport again”. I laughed for like….20 minutes. The longer we drove, the more I realized I think I built up Amy’s expectations for this trip. She had her own story of a ghost town that she came upon in Arizona about 7 years ago. It was an actual ghost town. She could even wander in and out of the houses. Super creepy and super awesome. She said she even had a dream about our trip the night before. In her dream a tornado had dropped a house next to her, on its side. She really wanted to go searching through it but she wanted to wait for me. That was sweet, even if it was a dream. So we headed to our first stop. Piqua! The reason that I wanted to stop here on the way is because it was the last residence of a great great grandfather, Daniel Staudt. As we drove through we were kind of stunned by some of the amazing neighborhoods in this random little town. As we began to follow the directions towards our family’s home we realized he was not in one of these neighborhoods. He was definitely on the other side of the tracks. We found the house. He died in 1935, so I’m guessing this was probably the actual house he lived in. It doesn’t look newer than that. 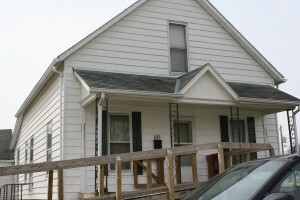 621 Miami, in Piqua, Ohio. Last residence of Daniel Staudt, our great great great grandfather. Photo of Daniel Staudt from old timey days. Date unknown. His father, Simon, was a weaver. One thing we noticed about Piqua was that there was a restaurant called Weavers and a blanket company right on the Main Street. I’m going to have to look into that to see if there is any connection. We drove on to the Shelby County’s seat, Sidney. We loved Sidney. What a strange and interesting place full of amazing architecture. Also, I have not seen so many banks in one town square as I did there. My favorite was this one. I couldn’t stop looking at it. It was just so insane! Bank in Sidney. They promote "thrift". That colored section there, thats all TINY little tiles. It is also along the side of the building. 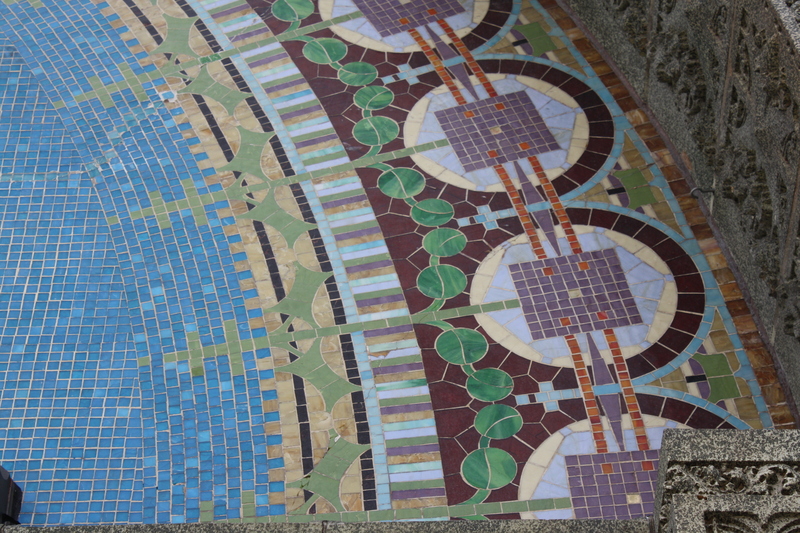 Some of the tile work on the wall of the bank closer up. Amazing! This building is covered with this stuff! The following pictures include my other favorite spot on the square. Please keep in mind that these two shops are right next to each other. There is one shop that separates them. The 4:20 shop. 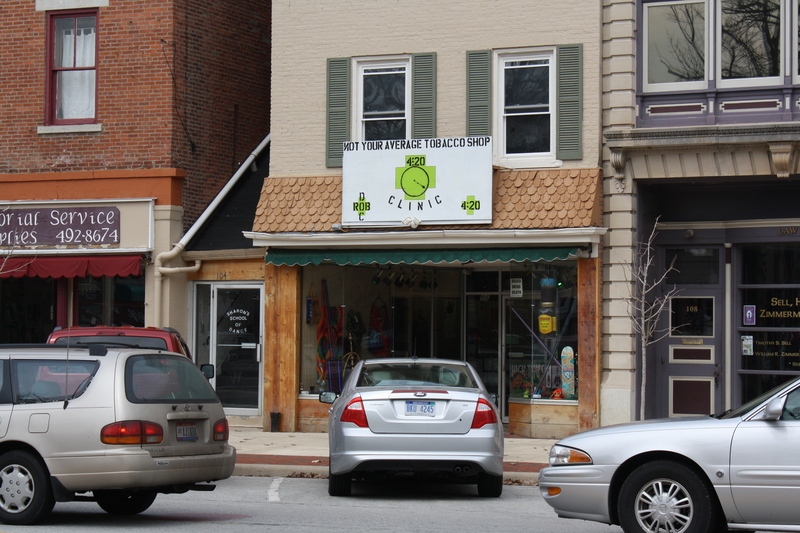 OBVIOUSLY not your average Smoke Shop. Doc Rob runs this place, as you can plainly see on the plywood sign. 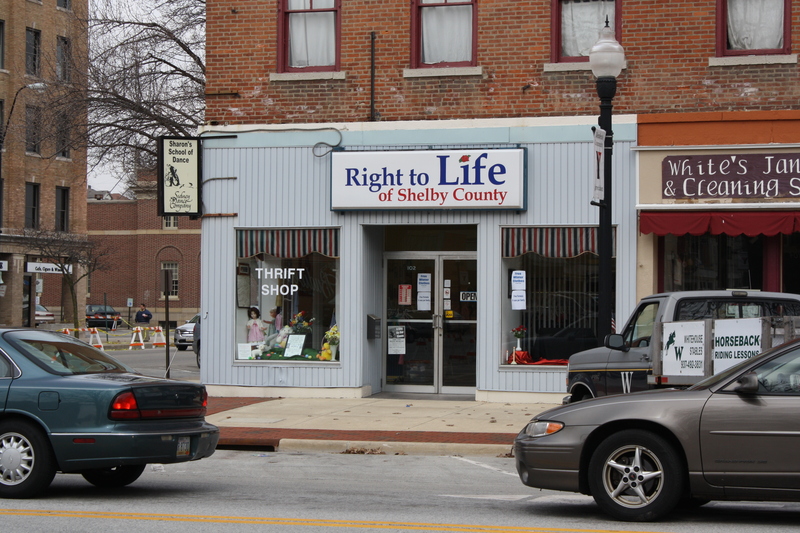 I believe this is a Right to Life Thrift Shop? And there is a dance studio here as well? I am hoping the dance studio space is upstairs or something. We weren’t crazy hungry yet so we headed to the library. This is the first time Lil’ Amsters has done any research with me. I think she was a little skeptical of being able to find anything here. We got down to the basement, where all the local historical information resided, and found one man researching and two adolescent girls snickering about cute boys and books about vampires (oh, the girls were spontaneous singers, as well). We found a WEALTH of information there in the basement. In fact, the information I was mostly seeking out was about Rumley and the Goings/Goins family. I found a book that was completely about the black communities of Shelby County, and specifically Rumley. One of the biggest questions I was trying to answer was: why did everyone leave? And why did they leave at this time? Turns out that was a question that a lot of people had. This book provided a few different ideas, that were different from ones I read before. This book suggested that maybe their southern style of farming wasn’t working in the north. I am guessing this would have caused them to move elsewhere earlier since they were there for like 30-50 years. Another suggestion was that they were irritated with all the white people moving into the area. So this book suggested that the families in Rumley were racist and annoyed with white people and wanted to move where there were less of them. This is unlikely since my family moved from Rumley to areas full of white people. So these were both very strange suggestions. Also, many of them had intermarried, soooo… They were of mixed races. Not really buying that argument. So, we’ve still got a mystery. Lil’ Amsters’ favorite part of the trip to the library was looking at the death record book, which includes the cause of death for everyone. I’m going to admit, this is very entertaining. I have to remind myself that these were real people and we shouldn’t be laughing at their demise but here are some of the good ones: killed while wrestling, yellow stomach, fits, confinement, drunkeness, teething, and sinking chills. Another thing I learned was that a distant uncle, Salthial Goings, was a RASCAL. I noticed before that he had been married a lot. Well turns out he got divorced a lot. In the divorce court records to a Sarah Goings, it states, “Goings, Salathial vs. Sarah A. Goings: Oct 1860. Death of plaintiff suggested, action abated.” Really? By “suggested” do they mean “assumed”? Or was he really THAT bad? There was so much more at the Sidney library to be researched, but we didn’t have all day. We spent about an hour there. By the time we left my stomach was RAGING with hunger. We headed over to a restaurant on the square called The Spot. And it truly was. They had some great malted milkshakes. I felt like I had walked into a small town version of the Peach Pit. That was a Beverly Hills 90210 reference for all those who didn’t catch it. After lunch we continued around the Sidney square again and marvelled at the banks and weird businesses scattered about. We drove out of town and headed to Rumley. We stopped at Collins Cemetery first. 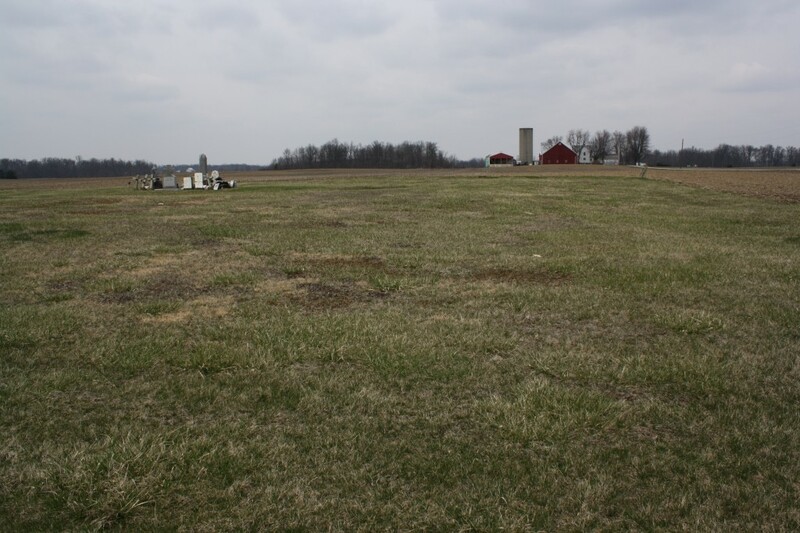 This is the “cemetery” I wrote about previously, which is actually just a weird slab in the middle of a field with a bunch of headstones stacked up and a memorial stone. I am wondering if this was the spot of the original cemetery. Are the bodies still buried here? Stacks of headstones in the "cemetery". View of Collins Cemetery from the road. We took a few pictures and continued into “town”. 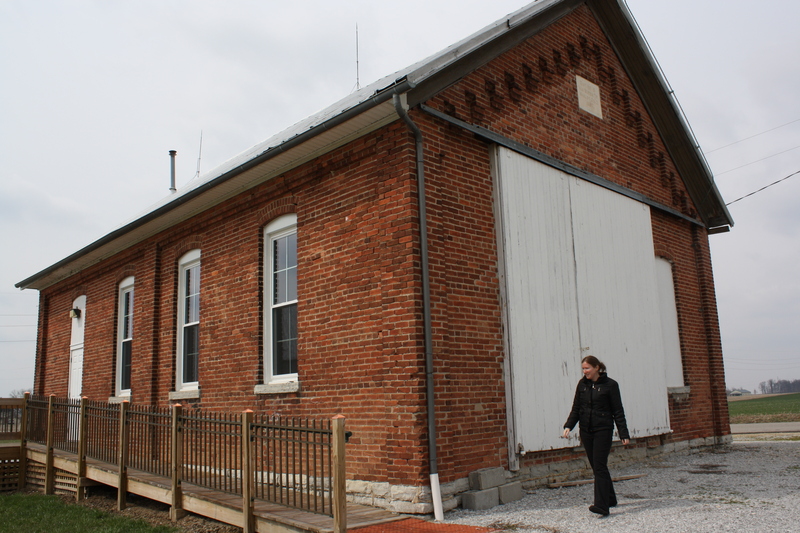 We stopped at the old schoolhouse which still stands there. At the library we did find out that this schoolhouse was actually built in the 1890s, which means that none of our family went to school here, but it was still pretty old and kind of awesome. Based on the context clues (beer boxes inside, huge BBQ smokers outside) this place is now used for a party spot. A gathering place. I’m just glad it’s being used and not being removed. Lil' Amsters checking out the exterior of the Old School House in Rumley. We moved onto the church and neighboring creek. We learned from the books in the library that this creek was where the residents and churchgoers were baptized. We wandered down to the banks and realized that they had recently had a flood. We optimistically hoped to find some random remnant of the old village but there was not much. We did find some bricks that were not stamped with a title, and wondered if they had been homemade in those parts, but they were pretty nice and seemed pretty newish. 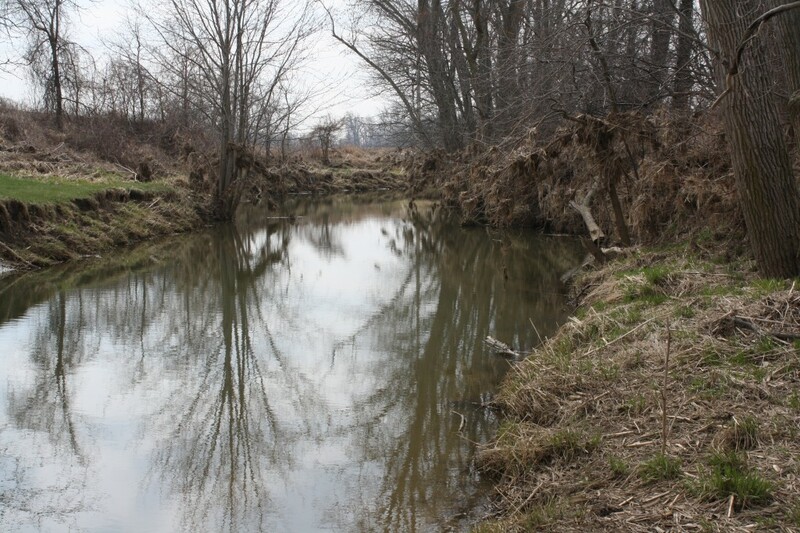 Loramie Creek that runs through the north section of Rumley. The site of many Rumley baptisms. We headed next door to the church and had a look. The church had very little information about their actual structure. I have no idea if it’s been rebuilt. It has at least been re-sided. Other than that I have no idea. 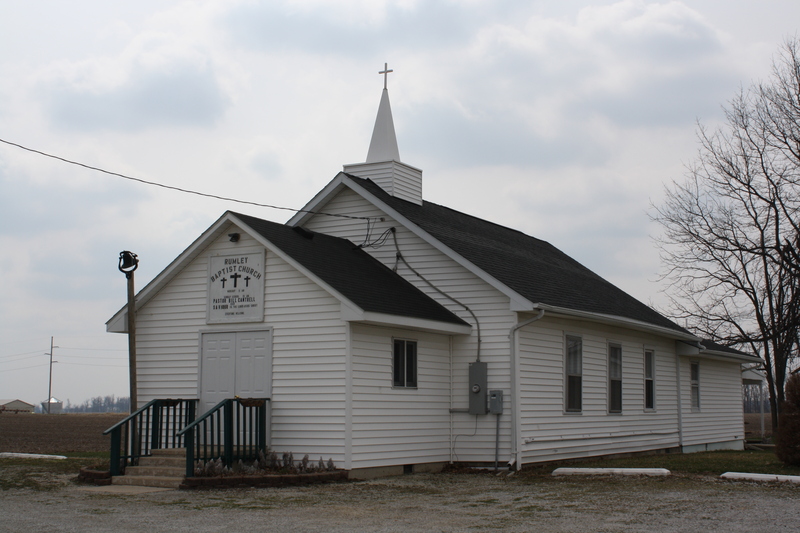 This is the Rumley Baptist Church. A memorial plaque to the old village remains on this property. As Lil’ Amy looked around she got kind of sad. She realized that there was really nothing left of the old village and no abandoned houses to rummage through. We hoped to see some of the old roads or something, or some old foundations. Nothing. Seems that this area has been cleaned up and there is nothing left. As we pulled off the main strip of Rumley we spotted something just beyond where the town would have been and pulled in. Just what we were looking for! And with no one around! Having a little peek. Seems it is used for nothing now, nothing much in there but used bottles of alcohol. This place DOES seem like the kind of place to throw a good party. 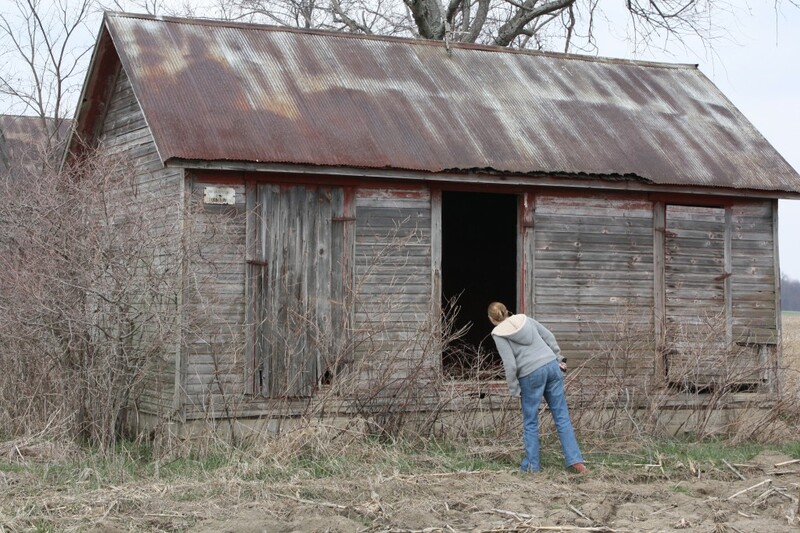 Amy got her fix of abandoned properties and we moved on. We found Houston and the church and the cemetery. We had a lovely little walkabout the cemetery, till the wind shifted and the cow smell became very apparent. The walk became less lovely, but we continued on. We found the graves of most of my direct Staudt relatives. Victory! 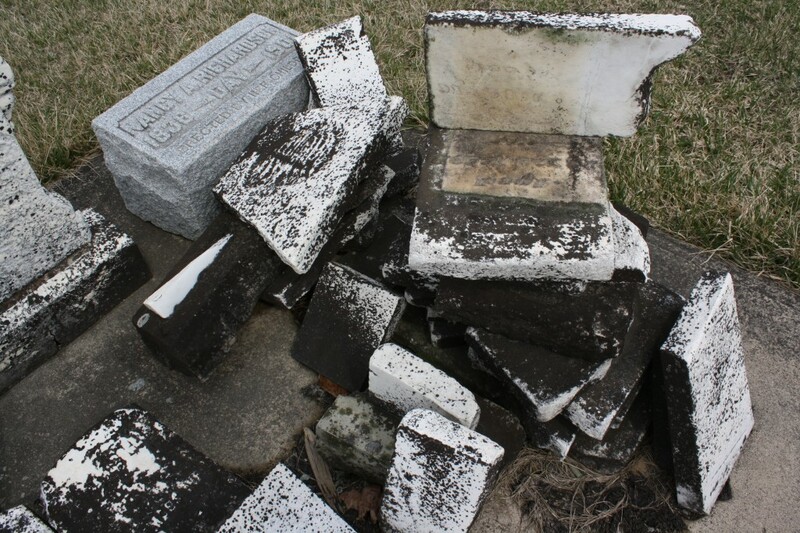 Headstone of Simon and Catherine (Oliver) Staudt in Houston Cemetery. We hopped in the car and headed for home. One of my favorite parts of the trip was soon to come. Before long Lil’ Amsters was on the phone and I saw a sign for an Historical Marker. I can’t pass a sign like that without inspecting. 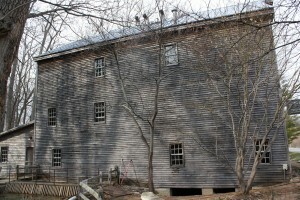 I turned down the street and found something amazing, Bear’s Mill. This is a still functioning mill that houses a shop where they sell the grain and cornmeal they still make. They also sell the wares of Darke County, Ohio residents. I ended up buying some Bear’s Mill blend coffee….and it’s kind of awesome! We continued on through a few small towns. And then hit Indiana, and turned south on IN 227. What an amazing stretch of road. If you love those little quick hills that bring your stomach up through your throat you will LOVE this road. I was squealing for miles! Literally miles. Lil’ Amsters on the other hand was trying not to squeal as she was on the phone and was trying to not be rude. She did raise her arms in the traditional roller coaster stance. While on 227 we also drove through some wacky little towns as well as some amazing ones. Whitewater, Indiana. Strange. That’s all I’m gonna say. 227 took us back to the interstate and we took the boring way the rest of the way home. Lil’ Amsters complained that my car was going to fall apart and that I was driving too fast for it. I was driving the speed limit. Welcome to my life. 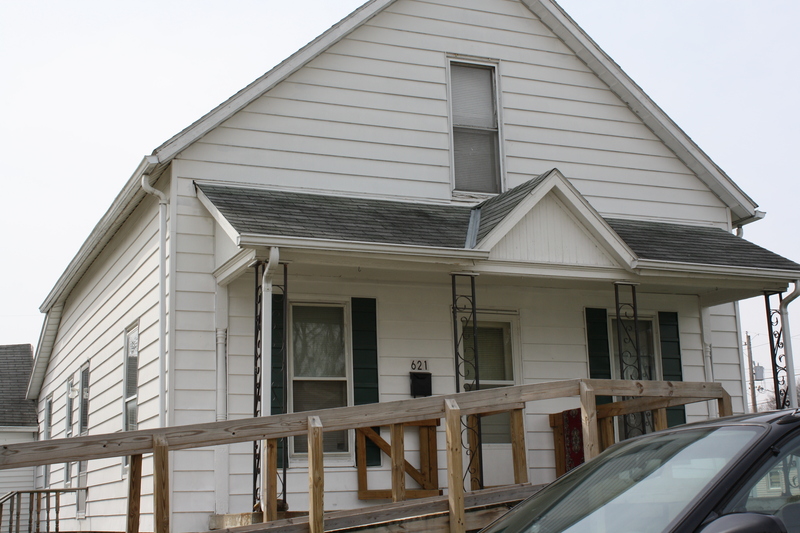 This entry was posted in Brown Family, Genealogy, Travel and tagged ancestry, architecture, Bear's Mill, cemetery, Collins Cemetery, family history, genealogy, Goings, Indiana, Ohio, road trip, Rumley, Shelby County, Sidney by amanita. Bookmark the permalink. We’re definitely distantly related. My Staudt family also descended from Simon, and actually live within a few miles of where Simon and Catherine lived in Miami County Ohio. I have two of his coverlets he wove in 1844, along with lots of family information. 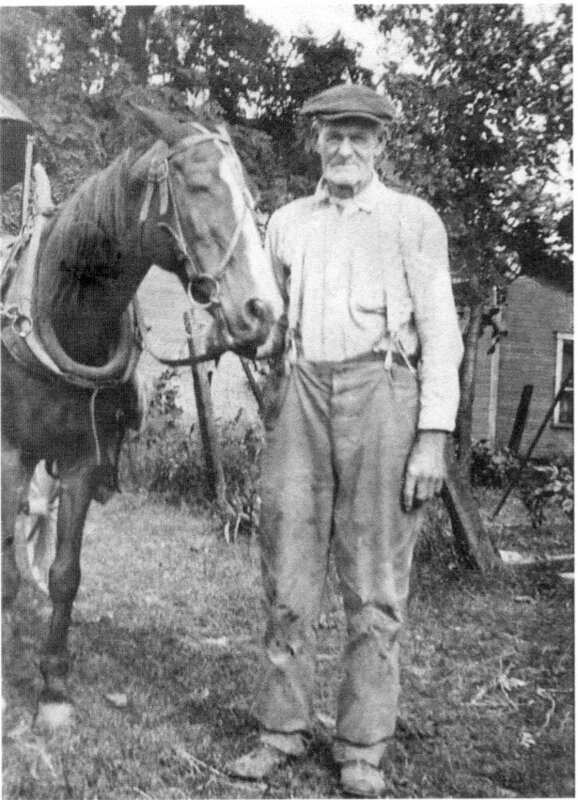 Daniel Staudt was my great-great grandfather, his son William James was my great grandfather. I’ve never seen the picture you have posted here, it’s great! Jeff! Well hello, distant cousin. That’s great you found me. 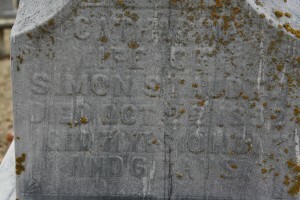 I am related through Mary Catherine Staudt, who was William Staudt’s sister. 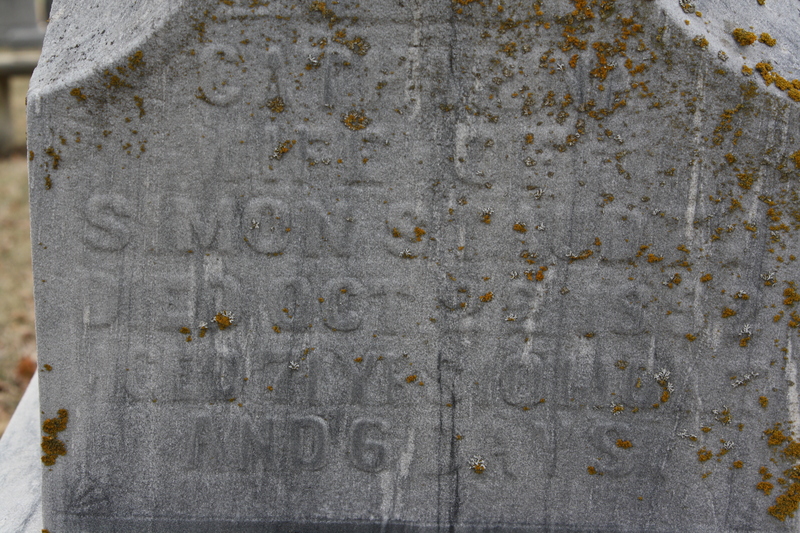 Mary Catherine was my great great grandmother. I have one picture of William from my dad that I’ll send you over email. I love that you have some of Simon Staudt’s coverlets. I’ve only seen a picture of one of them. Were they passed down through the family or did you end up buying them? I have seen a couple online that were up for auction here and there. Hope you enjoyed the blog. 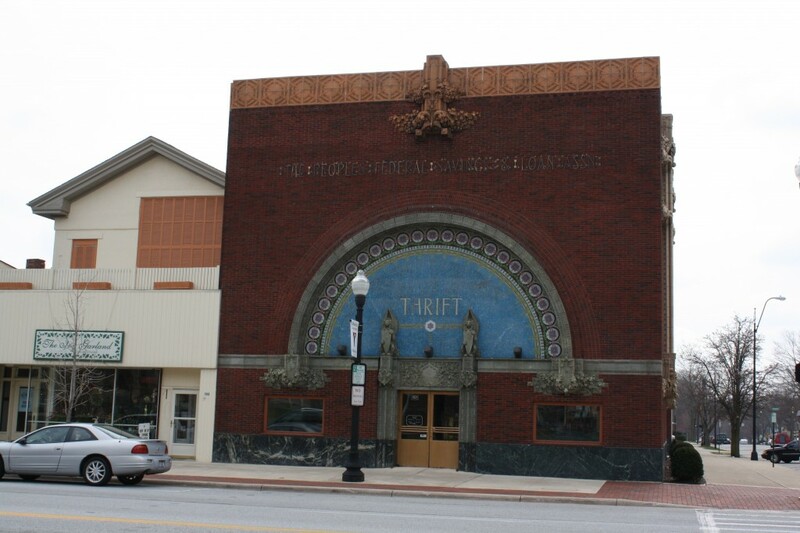 Staudt of Covington Oh. Rufus is the son of William Staudt. some interesting information on your side of the staudt family. Please contact me when its possible for you. I’ve had computer problems, and lost the wonderful picture’s you sent me and would like to get them again. Thanks! Your blog is fascinating. I am related to George Westley Goings, Joel’s brother and son of Jason Goings. I have been researching the family for 15 years and have a wealth of information. The answer to why they came and why they left is complex and in the end uncertain. I think the principle answer lies in the story of the “Great Black Swamp.” Rumley was right in the middle of the swamp and was on very poor and very unhealthy land. There were a number of cholera and malaria empidemics during the period. A number of people died and others moved away. You also mention racism which was a major issue as the war ended. A large number of German Catholics moved into the area and this also lead to a displacement of the mixed race people. With the advent of the Industrial Revolution this became just another failed community. I have a great deal of information but do not want to put it in a public blog. We can communicate directly if you like. Doctor Craig (DC) Goings (1839-1911) is perhaps the most famous of the 15 children of Joel Goings (1760-1848) and Elizabeth Cole (1801-1869). He was a famous faith healer and wrote a couple of books on faith healing and the family. He had a farm in Piqua, Ohio. A number of the extended family meet on his farm a few times a year. The next meeting in around Labor Day. I am a distant relative of dc goings. I am also a descendant of Dr. Goings and Etta Rebecca Fox. Just stumbled upon this blog while doing a search for the Rumley School House. My uncle has something to do with the maintenance and renting out of this building. In fact, most of my cousins and I have had our high school/college graduation parties there (well in the barn that they built right beside it). I assume most of the “context clues” were remnants of one of our family get togethers. Thank you for sharing! What a neat place to have get-togethers. I just love those old schoolhouses. I always thought adapting one into a home would be so cool. Very neat. Thought I’d stop in to see if any new things are going on since the last time I visited the site. I’m still doing research into my Staudt family ancestry, and would enjoy hearing from you. Hey Jeff! I have been neglecting this blog (and my tree) over the past year or so because I have a one year old who doesn’t like when I do anything but attempt to amuse her. I am hoping to have some more time to work on things this summer. Did I tell you I ended up buying the Staudt coverlet that was on EBTH.com? It needs some work…but I can’t wait to put it up. I’ve recently caught the ghost town history bug which led me to you blog. I actually live less than a mile from Rumley. I was absolutely thrilled to see the inclusion of People’s Federal (the bank in Sidney), The Spot, and especially the Rumley schoolhouse. My family has a few connections to these locations. First off, my mother has worked at a branch of People’s Federal in a town nearby to Rumley almost my whole life, with the occasional shift at the main office you showed above. Secondly, and more importantly, my father and his friends and siblings are the current “caretakers” of the old Rumley schoolhouse (I even helped build the ramp that attaches to the main door). If you would like, I could poke around in the family and see if anyone knows more about the history of Rumley. All I really know about it I learned from a framed newspaper article about its founding hanging in the schoolhouse itself. But, knowing my relatives, I’m sure there’s a lot more information floating around somewhere. If you’re interested, send me a personal email and I’ll send some things your way that I’ve found about Simon since we first talked a while back. Just saw your blog for the first time today. Didn’t see anything about the Randolph and Rossville connection with Rumley. Was this something I missed?